Can I have a declinable participle, please? One of the major constituents of the initial massive overhead required in learning ancient Greek is the participle. Participles are extremely important in ancient Greek; where possible, it seems, it’s preferable to a finite verb. Because they decline and agree in gender, number, and case with what they modify, participles seem complicated compared to English; on the other hand, this reduces the ambiguity that can exist in English with participles, a la “I saw the dog running down the street.” Is it “I” or “the dog” which is running down the street in that sentence? In ancient Greek, however, there would be no confusion — the participle would either be in the nominative case, meaning it would agree with the subject “I”, or it would be in the accusative case, meaning it would agree with the direct object of the main verb “saw”, “the dog”. In English, having lost most of our inflection, we depend on word order and proximity, as well as context, to tell us grammatical function, so the only real way to distinguish whether it’s I or the dog running down the street is to change the sentence to “Running down the street, I saw the dog,” which unfortunately seems a little stilted and artificial. “I saw the dog while running down the street” is a little better, but it seems to imply the imperfect periphrastic “while I was running down the street,” which starts to edge away from a pure use of a participle. Εἴδον/Ἔβλεπα τὸν Πέτρον βαίνων εἰς τὸν οἴκον μου. Here, the participle βαίνων is in the nominative case, making it clear that it agrees with the unexpressed subject “I” (unexpressed since the -ον/-α ending of the verb already makes it clear that we’re in the first person). All of this is to say — here’s to inflected languages. Pay now or pay later. I didn’t notice it until I was having to enter track names manually (Manuel-ly?) in iTunes, but anybody want to look at the track list and tell me why this CD is poorly named? Thanks to Fr. Benjamin Johnson over at Western Orthodoxy, I learned of The Saint Ambrose Prayer Book a week and a half ago or so. Much of the formation I had as an Episcopalian which led me down an Anglo-Catholic path was thanks to The Saint Augustine Prayer Book, and while I’ve not had the nagging, unfulfilled yearning for that aesthetic that some ex-Anglicans have, I do have to give credit where it is due to the Anglicans who taught me about Apostolic Succession, the Sacraments, and the Real Presence, among other things. Thus, the idea an Orthodox devotional manual after the fashion of the St. Augustine at the very least got my attention. It arrived yesterday, and while I’ll keep my comments brief, it’s presented really nicely. It is compact, practical, easy to read, the catechetical information is very useful, and the renderings of the prayers and liturgical texts are beautiful and elegant. It is clearly a conscious Orthodox re-think of the St. Augustine, to the extent that it is organized in a nearly identical fashion, many of the images used are similar, the typeface is pretty darn close to being the same, and even the Forewords are word-for-word identical in places. I found myself wondering at times if the text of the St. Augustine had been entered into a word processor and then simply updated where it was determined was necessary. As a result, it feels very much like seeing an old friend wearing brand new clothes. This is not necessarily a bad thing, by the way; I’m no authority one way or the other on the implementation of the Western Rite and have never seen it in action, but I do think that, insofar as it is an attempt to reclaim historically Orthodox liturgies for modern practice, it could be a good thing. I have no way of knowing if it is or isn’t in its present manifestation. My main complaint is, as with many Orthodox publishing projects, the copy-editing could have used at least one more pass, and some of the typos are a bit embarrassing, given how nice the rest of the book is. The Foreword somehow manages to be a “Forward”, and there are a number of places where “principle” manages to sneak in for “principal”. If you’re talking about a primary reason, folks, use the word “principal” and do so on “principle.” Follow me? There are also errors like being referred to page 188 for the Six Penitential Psalms, only to have nothing of the kind be within ten pages of 188. One hopes these things can get cleared up in a second edition. I’ll have more to say once I’ve spent more time with it, but I’d recommend it, at least at this point, partcularly to somebody who comes from a background like mine. You’ll remember some of the good things about Anglican practice that helped you to relate to Orthodoxy better when you started down that path. About a week and a half ago, I attended a lecture by a visiting scholar. I’m going to be intentionally vague about the details, mostly out of professional courtesy, and also because, not being certain exactly what happened, I feel I need to assume that there’s an honest mistake that occurred, one for which it is not my place to pillory anybody publicly. Anyway, the lecture was fascinating. In the Q&A portion of the talk, I asked a question which was, perhaps, somewhat outside of the scope of the talk, but certainly relevant regardless. The visiting scholar gave a great answer, providing a patristic quote which really piqued my interest, and I walked away really impressed and with what seemed to be a potential avenue of research. The trouble: I’ve been unable to verify that the quote actually exists anyplace. An initial perusal of some references when I got home yielded nothing. I e-mailed the visiting scholar and asked where the quote came from; this person replied saying that it had been encountered while dissertating (twelve years ago), and gave the name of an article that they thought might be where they encountered it. If I couldn’t find it there, this person suggested checking looking at a particular work in the PG, but didn’t know where exactly it might be. I don’t mind checking the PG; that’s good Greek practice for me anyway. Still, something about this seems fishy. It’s possible that my question was one this person wasn’t expecting, and they just tossed out the first thing they thought they remembered. It happens. The subsequent wild goose chase for a quote which I’m now wondering if it even exists, however, is bothering me. It’s okay if I asked something that was outside this person’s field of expertise; no biggie. If that’s the case, though, their attempt to improvise an answer has, for me anyway, made me question my impression of the rest of their presentation. A similar incident, and here I don’t mind naming names because the event was far more public with the audio being widely available online, occurred at Fr. Richard John Neuhaus’ talk at the Fellowship of Ss. Alban and Sergius Conference. As I reported months ago, he told a very touching story about Fr. John Meyendorff’s response to the papal encyclical Ut Unum Sint — “[W]ith tears in his eyes, [Fr. John Meyendorff] said, ‘This is the great tragedy. For a thousand years… we have been waiting for a pope to say what John Paul says in Ut Unum Sint. The great tragedy is that we have not found any way to respond. '” You can listen to him saying that for yourself right here. It’s at the 27:13 mark. Here’s the problem — there is no way it could have happened. Ut Unum Sint was promulgated in 1995. Fr. John Meyendorff died in 1992. Unless Meyendorff was privy to a very, very, very early draft, Fr. Neuhaus was quite mistaken. I asked a couple of people about this, and got a not terribly satisfying answer — something to the effect that he probably had a senior moment and tossed in the first name he could remember. I suppose I could see that if it were in the question and answer portion, but it wasn’t — it was in the prepared and read portion of his session. I don’t know what happened. Maybe he really did mean somebody else. I certainly don’t mean to disrespect the departed, so I’m not trying to imply that Fr. Neuhaus knowingly pulled a fast one — but you can listen to the talk for yourself, and then go look up the dates for yourself. It’s a pretty big error, an error I’ve not heard anybody else address, and it seems like it would be important to address, given that it was clearly intended to have a lot of resonance with the location and theme of the conference. It’s a pretty obvious point, but an important one — sometimes the people who should know what they’re talking about, don’t. It happens to everybody, even them. Don’t let bedazzlement get in the way of fact-checking. One nice thing about listening to Ancient Faith Music is that it can bring to my attention recordings of international origin of which I would otherwise have had no knowledge. A terrific example is My Soul, Rise Up! put out by a self-described “ensemble of folklore spiritual music” called The Svetilen Ensemble. Last week I turned on AFM and heard this joyful, full-throated, not careful, and stunning singing, and I had to know where it came from. Yesterday the CD arrived, and the whole thing is pretty much exactly like the excerpt I heard. It’s not all liturgical music; some of the pieces are folk part-songs (called kanty, so far as I can tell — somebody can correct me if I’m wrong) on Christian themes but which are paraliturgical. One thing the recording really does right is that it recognizes the link between folk culture and liturgical singing, and it emphasizes that folk culture shares a lot of common elements across national boundaries. Many of the kanty sound like American Sacred Harp hymns which just happen to not be in English, for example. Anyway — time does not permit a full review at this time, but this is a recording well worth a listen. Some excerpts may be found at the link provided above. 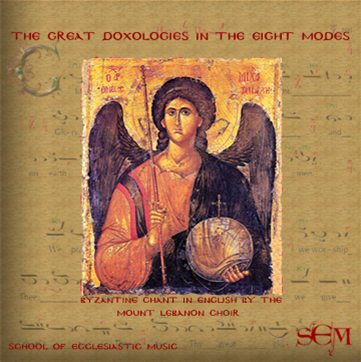 A brand-new recording is The Great Doxologies in the Eight Modes by the Mount Lebanon Choir. Now that we have a couple of decent (and up) recordings of the Divine Liturgy in English, the ensembles active in this kind of thing are going to start looking for other things to record, so here we are. The Great Doxologies is good for the reasons the Mt. Lebanon Choir’s The Divine Liturgy of the Holy Orthodox Church of Antioch is good and kinda, er, quirky for the reasons their Divine Liturgy is quirky. You’ve got authentic chants by people who know what they’re doing, with a high level of musicianship all around, to say nothing of Old Country legitimacy. This also has the extra value of being the only recording of its kind in English so far. On the other hand, the English diction, while better than a recording of me chanting in Arabic would be, is clearly not at a native level. This is okay with me, but it will make it a tough sell with some of the folks whom this recording is intended to help win over to Byzantine chant. Additionally, as with The Divine Liturgy, it sounds like an organ is used to shore up the ison (although an organist is not credited in the notes), and that just sounds not quite right. Still, where the matter of good recordings of Byzantine chant in English is concerned, more is more, I think, and hopefully all of these efforts combined will bear good fruit down the road. If anybody’s taking requests, I’d love to see some festal Vespers or Matins recordings. “O Lord I have cried” in all eight modes, maybe. A recording of Holy Week music, of course, would also be a great thing, as would the Great Supplicatory Canon. Perhaps also examples of how some of the offices like Small Compline, First Hour, etc. can be sung if desired. Maybe we need a few more ensembles specializing in doing this stuff well, too. More is more where this is concerned, as I said.